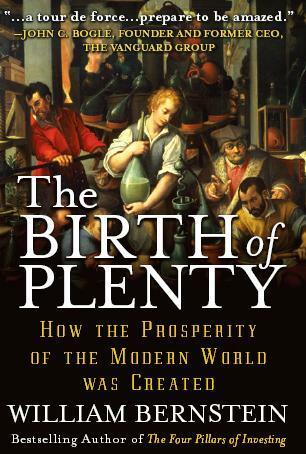 This book, The Birth of Plenty Predictions: How the Prosperity of the Modern World was Created, purports to explain the conditions necessary for a nation to escape the Malthusian Trap. The author, William Bernstein, states that four conditions are necessary: 1) property rights (including intellectual property rights), 2) the scientific method, 3) efficient capital markets, and 4) transportation and communication infrastructure. The first part of the book explains why each component is necessary. The second part of the book applies this structure to the historical evidence associated with various countries to show that all four components are necessary. The third part of the book attempts to make predictions based on the thesis. This is an excellent book. It is easy to read, full of interesting historical facts, and is well reasoned for the most part. Unfortunately, the author attempts to defend the welfare state as created by Roosevelt in the USand the mixed economy of Great Britain. This clearly departs from his thesis. First of all, the welfare state under FDR was an attack against property rights. Despite the author’s claim that regulation of capital markets is necessary for them to be efficient, all econometric studies show that they are at best ineffective and most likely damaging. This means that the regulations FDR created to regulate the financial markets caused the capital markets in the USto be less efficient. Sarbanes Oxley is present-day example of the damage caused by absurd regulation of capital markets. The New Deal was not based on scientific method, it was based on emotion and the desire for political power. (For more information see FDR’s Folly: How Roosevelt and His New Deal Prolonged the Great Depression). So at least three of the four criteria were undermined by FDR and the “New Deal”, (AKA the bend over and take it deal). The author’s defense of the New Deal is based on sociological studies that show income disparity between the wealthy and the poor causes social unrest. These studies are clearly flawed. Income disparity can occur because of political favoritism (crony capitalism) or because of the opportunities created in a free economy. These studies do not differentiate between these two very different situations. As a result the studies cited by the author are contradictory and therefore do not support his thesis. How do the four factors apply to the UStoday? Property rights have been under assault in the US., see Kelo v. City of New London . Patent rights have been weakened since 2000, see Intellectual Property Socialism. The scientific method has been under attack by both the political right and left, see creationism and global warming – climate gate. Our capital markets have been significantly compromised by Sarbanes Oxley and now the Frank Dodd financial reform act. For more information see Sarbanes Oxley the Medicine is Worse than the Disease. The US transportation and communication infrastructure is slowly deteriorating because funds are appropriated in larger percentages to social welfare programs. The US is regressing in all of the four categories that Bernstein defines as necessary for sustained economic growth. It is no wonder that the US is on the verge of bankruptcy.